Malaysia chess history is an area that i will be always interested in. I was inspired by the book of Sejarah Catur Indonesia (Indonesia Chess History) by Ds.F.K.N Harahap which contains valuable information about chess development, important facts and data, theories , hypothesis about Indonesia chess history brought by by the hindu's wanderers way back from one decade before christ ( b.c ) , the dutch colonial in the 16th century , period in world war 1 & 11 and untill Indonesia participation at the Chess Olympiad, Thessalonika, Greece in 1984. Recently i done a so-called "research" from the internet, books and magazines regarding Malaysia chess histrory. Actually there is many important moments happens in Malaysia such as 1990 final world championship candidates' match between Anatoly Karpov and Jan Timman in Kuala Lumpur but unfortunetly there is no proper information, photos whatsoever in this important moment . I hope my small initiative here could be share with others chess enthuist to properly record Malaysia chess history for our own knowledge and perharps for younger generations. So far my main resources is from Penang Chess Association Website - the lovely and fascinating website from Malaysia chess history point of view. The history information, photos supplied by Malaysia famous chess person Quah Seng Sun in this website and another great sources - his Online Chess Column in The Star was unbelieveable. I also done some random research in the internet and i hope that anyone that intersted to share, add and correct! this work, you are always welcome. There is a few information that is not clear were written in red. I read two theory about the origins of chess in Malaysia. The first theory by H.J.R. Murray in his voluminous work, A History of Chess, mention that chess came from India where as the second theory by (Chien Chun Ching, "Research in Chinese chess from the Tang and Song Dynasties", p. 86, Hong Kong, 1984 (in Chinese) - said that chess came from China through Burma, Laos, Vietnam and Cambodia. From there it reached Thailand and Malaysia and crossed to the island of Java in Indonesia, where chess relics have been found. (Chien Chun Ching, "Research in Chinese chess from the Tang and Song Dynasties", p. 86, Hong Kong, 1984 (in Chinese). Although Chinese chess itself is still played in Vietnam, other variations of the game took hold in most of the other countries. Some of these have now died out or, as in the case of Malaysian chess, have been radically modified in recent times so as to conform more closely to the rules of modern western chess. ("Rules in Malay Chess", Royal Asiatic Society - Striates Branch Journal, Singapore, No. 49, p. 87-92 (1907), also No. 8, p. 261 (1917)). "The game of chess as played by people dwelling in the |Malay Peninsula is, as would be expected, the same as that of their close neighbors and co-religionists of Sumatra and Java. Malayan names of the piece are derived from Persian and although much chess is played throughout the Peninsula, no chessmen of any great merit have originated there. 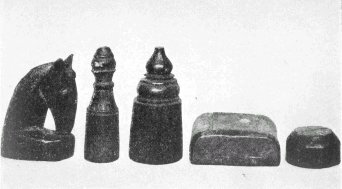 There is no recognized traditional type of chess piece associated with Malaya, but simple playing pieces based on Muslim sets were made from nineteenth century onwards. This simple sets were turned to similar Muslim design but with straight- sided diabolo forms surmounted by oviform finials. One side was stained or dyed either red or green and the material used was either Malayan ivory or softwood. They were used before the nineteenth century and are still played with today using the same design. The bishop are 13/4 in (4.5cm) high and the Pawns 7/8 in (2.2cm) high." 7th c AD - Located on the maritime roads linking China and Japan to India and Persia, the Malay islands and peninsula have been influenced by a deep and strong Indian influence before the islamisation, since the 7th c AD. Those people adopted Buddhism and Hinduism and rules mighty empires like the Çailendra at Java from 7th to 12th c. which built Borobudur temple, Çrivijaya at Sumatra from 8th to 13th c., and Majapahit in the 14th c.
Malay Island probably took Chess as well from Indians. Chess is attested there since the first European (Portuguese) contacts at the beginning of the 16th c. and seemed already well known when it happened. However, the game was later on deeply influenced by the European play. For instance, the modern moves for the Queen and the Bishop were adopted. Main means "game" and Chator is obviously "chess", as a broken form of Sanskrit Chaturanga. The Malay name of the pieces also come from Sanskrit (Raja, Mantri, Gajah) or from Tamil and Telegu, Dravidian languages from South East India (Kuda, Ter, Chemor). The only exception is Bidaq which obviously is inherited from Muslim contacts (Baidaq in Arabic). Two kinds of sets exists. One very basic, carved in 10 mn from bamboo or other vegetals with abstract shapes, the other is finely carved. Interestingly, the Rook is represented by a Boat there, like in certain parts of India and in Burma. It probably denotes the Hindu influence, a common character with Thailand and Cambodia where Boat is name of the piece. 1856-1908 Wan Ahmad bin Muhammad Zain (1856 - 1908) or Syeikh Wan Ahmad Patani is a famous Muslim Scholar in South East Asia.He debate the origin word of chess in Malay - catur which being used by Malaysian and Indonesian . 1935 or is it 1933 ? - Xie Xiashun, nick-named "Centurian chess king" because at 100 years old, he was a strong player in all the three forms of chess. Xie, not related to former women's world champion Xie Jun, helped to promote the game and was the top player in China after the 2nd World War. In 1935, he visited Malaya and Singapore and defeated their champion as well as the British Air Forces champion Hunter. 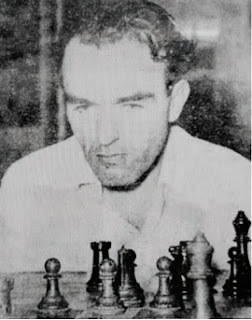 1949 - The first Malayan Chess Champion was Dutchman - J.Fernhout (Java). The event was held at Boston Cafe in Penang on 16-18 April and attracted entries from Java, Singapore, Penang, Selangor and Kedah. A trophy, a silver king valuing $500, was donated by Aw Boon Haw, a Burmese Chinese entrepreneur and philanthropist known for introducing Tiger Balm in Malaya. 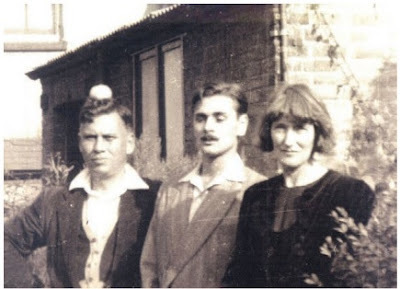 Pat Aherne (middle) - 2nd Malayan Chess Championship Champion. He died in June 2016. 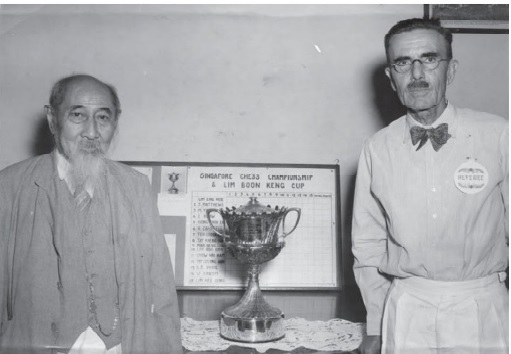 1951 - October 1951 - Johor Chess Association was formed by Dr. Yeoh Bok Choon ( source here - Quah Seng Sun - Star column 1st March 2012) - The Oldest Chess Association in Malaysia ! 1972 - Malaysian Team particapted in the 20th Chess Olympiad at Skopje, Yugoslavia. The first ever since the initiation of the Chess Olympiad! 1972 - April 1972 the President of the International Chess Federation, Professor Max Euwe was in Kuala Lumpur, and five students from Penang were selected to participate in a simultaneous match against him. 1972 – The Malaysian Schools Sports Council or MSSM hold its first national students team chess championships at the Dewan Sri Pinang from Dec 28 to 30 1972. Chess was introduced into the Majlis Sukan Sekolah-sekolah Malaysia programme. States started organising state-level chess tournaments and it culminated at the year’s end with the first-ever MSSM team chess championship. The Malaysian Schools Sports Council held its first national students team chess championships at the Dewan Sri Pinang from Dec 28 to 30 1972. It is being held to coincide with the Pesta Celebrations and was officially declared open by the Minister of Education, Dato Hussein Onn at 3pm on Dec 28 1972. Selangor won the events. 1972 - Malaysia participated at 20th Chess Olympiad 1972 at Skopje, Yugoslavia, the first ever since the initiation of the Chess Olympiad!!! Seeded . Placing : 59/62. 1973 Chess Association of Malaysia (CAM) , the precursor of the Malaysian Chess Federation (MCF) was deregistered. The Malaysian Chess Federation (MCF) continued from where the CAM ended. The late Dr.Foo Lum Choon is one of the President. 1973 in 1973 or so, there was a weekly programme on RTM1 to teach chess to beginners. The presenter was High Court Judge Dato' Annuar (is it Y.A. Dato’ Anuar Bin Dato’ Zainal Abidin ? ) who was the president of the Perak Chess Association. 1974 Chess Association Of Selangor (right) , one of the oldest and most active chess associations in the country were form . The first 'Selangor Open' was launched soon after the establishment of The Chess Association of Selangor ('CAS') .Till now (2008), it's the longest running chess event in Malaysia. 1974- The Penang Chess Association had the honour to assist the Malaysian Chess Federation organise the First Asian Team Chess Championship from 9-21 Dec 1974. This event was organised concurrently with the Golden Jubilee (50 years)celebration of the World Chess Federation which held its Bureau Meeting here. Dato Tan Chin Nam, then President of the reorganized Malaysian Chess Federation invited China to attend the 1st Asian Team Championship with observer status. 1974 Choo Min Wang won the 1st National Closed Championship held at the FAS building in Kuala Lumpur. 1974- at the invitation of the Malaysian business tycoon Dato Tan Chin Nam, then President of the reorganized Malaysian Chess Federation, China was invited to attend the 1st Asian Team Championship with observer status. It was also in 1974 that China held its first National Championship tournament. The first international tournament ever held in China was in 1980. 1974 Mr (Now Dato') Tan Chin Nam was elected as the President of Malaysian Chess Federation (MCF). 1974 - Penang Chess Association organised the first leg ? of the inaugural Asian grandmaster chess circuit. 1974 - a seminal meeting was held in Kuala Lumpur that was attended by Malaysian Chess Association President Dato Tan Chin Nam, a prominent businessman; Lim Kok Ann, then President of the Singapore Chess Association; President of the Japanese Chess Association Yasuji Matsumoto; FIDE and Philippine Chess Federation President, Florencio Campomanes and two observers from the Chinese Embassy. The aim of this important meeting was to figure out how to raise the technical level of chess in Asia in order to reach the highest levels.